Trouble seeing this email? Click here. For a printable version of the Newsletter, click here. Click here for upcoming section meetings. Speakers: Kimberly L. Bick, Esq., Bick Law LLP; Dr. Mona Behrooz, P.E., California Regional Water Quality Control Board; Dr. Rula Deeb, BCEEM, PMP, Civil and Environmental Consultant, Geosyntec Consultants, Inc. The OCBA kicked off its trial advocacy program on Thursday, March 28, 2019. This unique five-week program and workshop approach gives participants the opportunity to learn from a distinguished panel of speakers while earning 20 MCLE credits. Thank you to program co-chairs Roy L. Comer, Robert B. Gibson, and Eric V. Traut. For more event photos, visit the OCBA Facebook Page. Have Good News of Your Own to Share? Contact OCBA Publications & Social Media Manager Jane Tang at jtang@ocbar.org to acknowledge your achievement through the OCBA. OCBA Offers Discounted Fingerprint Scanning - Today, from 11:00 a.m. to 2:30 p.m.
OCBA volunteers - Johanna Rodriguez, Rose Kabir, Lee Fink, Brooke Weitzman, Anne Rawlinson, Nathaniel Epstein, and Michelle Miu, joined the humanitarian service movement #HashtagLunchbag to create and distribute lunches to the local homeless community. Get all this and more in the May 2019 issue of Orange County Lawyer magazine. Should Putative Class Members Opt In Before Their Personal Information Is Disclosed in California Consumer Privacy Act Litigation? Lobbying, Election-Related Activities, and Advocacy: What Can, and Should, Your Nonprofit be Doing? Does a client’s legal need fall outside of your area of practice? Refer clients with confidence to the OCBA Lawyer Referral & Information Service toll free at (877) 257-4762. A non-profit legal referral service serving Orange County for over 55 years. LRIS refers to attorneys in over 30 different areas of law. Each call is carefully screened and each client receives a free brief consultation. JOIN NOW – Accepting new LRIS panel member applicants. If you have any questions, please contact the LRIS Membership Department at (949) 440-6700 x 128 or email lris@ocbar.org. Learn more about the OCBA Young Lawyers Division or join today! Here are some great opportunities to connect with fellow YLD members. Learn more about the OCBA Masters Division or join today and discover unique networking opportunities. Check out all upcoming 2019 events on the OCBA Masters Division webpage. 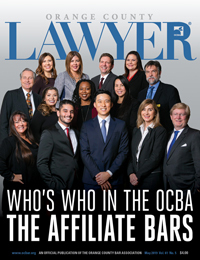 To submit affiliate bar events or news to the Orange County Lawyer, contact OCBA Publications & Social Media Manager Jane Tang. For more information, please visit the Courts and State Bar websites. Use of this communication implies that the reader agrees to hold the OCBA and its directors, officers, employees, agents, parent, subsidiaries, successors, and assigns harmless from and against any and all liabilities, claims, suits, actions, demands, settlements, losses, judgments, costs, damages and expenses to the extent that they arise out of or result from the inclusion or omission of any information in this e-mail. This communication is being sent to the above email address because the recipient has provided the OCBA with this email address for the purpose of receiving OCBA information. The OCBA does not sell or rent e-mail addresses to anyone outside the OCBA. To unsubscribe from future OCBA newsletter e-mailings, send an email to unsubscribe@ocbar.org.